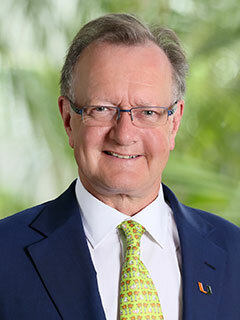 John Quelch became dean of the University of Miami Business School on July 1, 2017. He also serves as the University’s vice provost for executive education. Quelch has a wealth of senior leadership experience, having previously served as the dean and senior associate dean at three internationally-recognized business schools. Prior to joining the Miami Business School, Quelch was the Charles Edward Wilson Professor of Business Administration at Harvard Business School. He also held a joint appointment as professor of health policy and management at the Harvard T.H. Chan School of Public Health – the first to hold dual primary appointments in those two schools, and one of only a few faculty members across Harvard University with this distinction. Quelch has served on numerous corporate, nonprofit and public agency boards, including as chairman of the Massachusetts Port Authority. He is a member of the Trilateral Commission and the Council on Foreign Relations.